It has been a while since we’ve seen anything new from Timothy Haugen, but trust us, his adorable designs are worth the wait. Haugen creates fun paper printable toys such as dollhouses and little play people and animals. To make his low-cost, recyclable toys, all you need is a printer, a stack of recycled card stock and a refillable ink cartridge, and you’re in business. Haugen’s latest delightful creation is the Gnome Log Race Car Playset which includes some gnomes taking a break from gardening and collecting mushrooms to engage in speedy log car racing. The little paper log cars really work, so your child can zoom his gnomes all around the house or on their little included play mat. The 10 page PDF printable play set includes four gnome cars, play mat, bridge and pine trees, and easy to follow instructions. It has been a while since we've seen anything new from Timothy Haugen, but trust us, his adorable designs are worth the wait. Haugen creates fun paper printable toys such as dollhouses and little play people and animals. To make his low-cost, recyclable toys, all you need is a printer, a stack of recycled card stock and a refillable ink cartridge, and you're in business. Haugen's latest delightful creation is the Gnome Log Race Car Playset which includes some gnomes taking a break from gardening and collecting mushrooms to engage in speedy log car racing. The little paper log cars really work, so your child can zoom his gnomes all around the house or on their little included play mat. 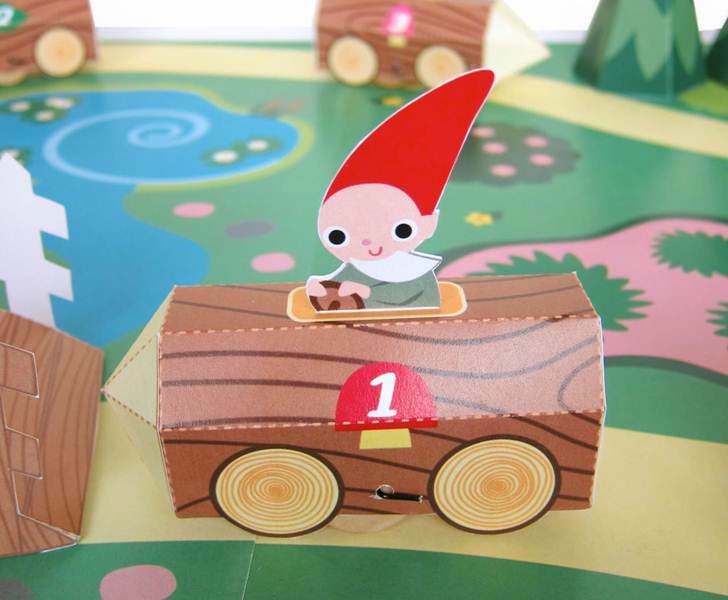 The 10 page PDF printable play set includes four gnome cars, play mat, bridge and pine trees, and easy to follow instructions.